The Karat pods are refillable pods with a 2 milliliter e-liquid capacity. 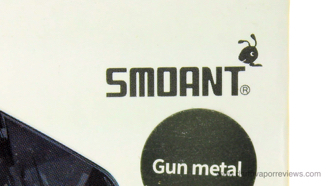 They feature a quartz coil with a 1.3 ohm resistance. 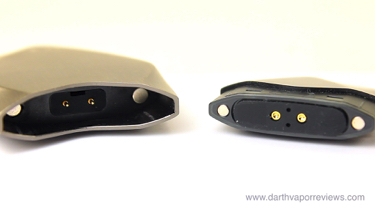 To get started, remove the pre-installed pod from the Karat battery. 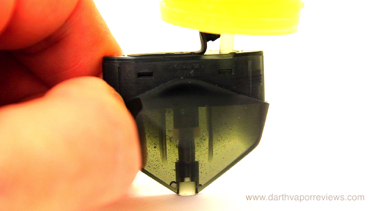 The bottom of the pod has two rubber plugs to fill through. 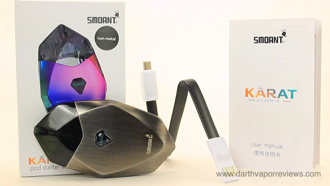 The Smoant Karat Pod System is a diamond shaped 370mah rechargeable battery combined with a refillable pod with a 2 milliliter e-liquid capacity. The kit comes in a sturdy cardboard box. 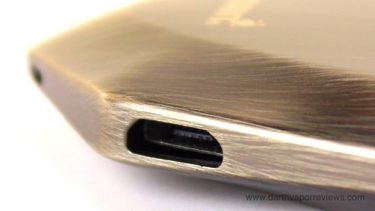 Inside, the contents include: a User Manual, a micro-USB charging cable and the Karat battery with pod. 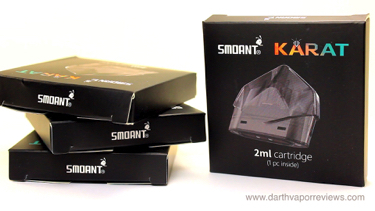 The Karat battery is a thin, buttonless 370 mah battery with a constant 3.4 volt output. It has a micro USB charging port on the side, an indicator light in the logo and two holes at the bottom to attach a lanyard. Pick one and fill the pod to the top with e-liquid. Once full, replace the plug. Let the pod sit for a few minutes to let the e-liquid soak into the cotton. 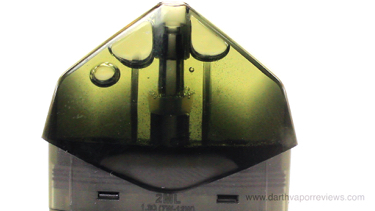 The pod has magnets on the bottom for a secure hold. 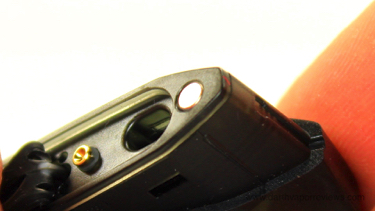 Insert the pod into the battery and you're ready to vape. Overall, an innovative pod system with a non-traditional look that works great. 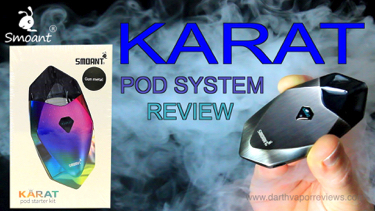 The Smoant Karat Pod System currently runs in the $25 - $35 range and comes in the five colors to choose from. If you would like to pick up the kit for yourself, just click on the links or the logo below. Have an excellent day and may the Vape be with you. The pods are MTL (mouth-to-lung) and at first seemed too tight to pull, but on the 2nd or 3rd hit, the Karat produced nice, warm vapor with minimal effort. 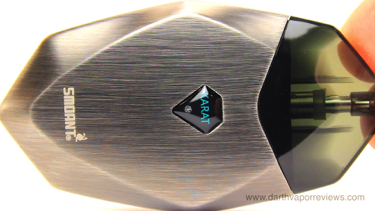 My only con so far is the battery life is too short for me as a heavy vaper, but it would probably work great for someone who is a light cigarette smoker. 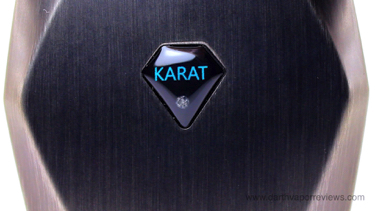 The Karat Pod System has a unique design with it's flat, diamond cut shape. The metal body is very nice with a high end look and feel. The pods fit very securely in place with no play or wiggle to them. The vapor production was excellent. * Short battery life for heavy vaper.